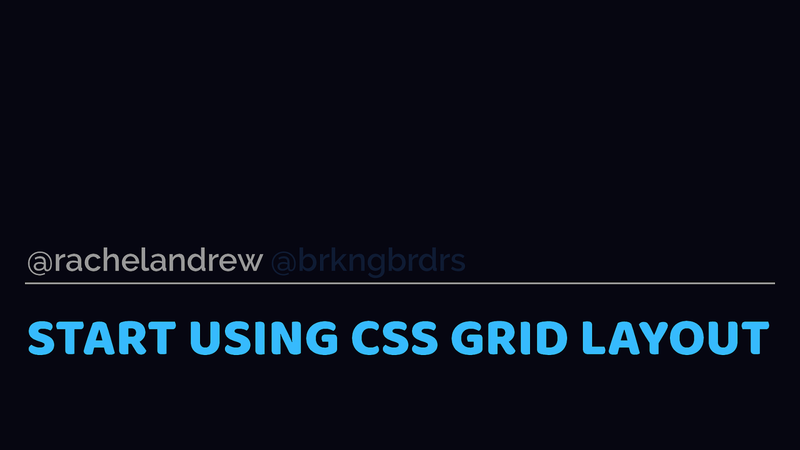 Start using CSS Grid Layout Today ▸ What is grid & why is it different to flexbox? ▸ How do I get started using grid in production? ▸ What about old browsers? ▸ How can we help encourage browsers to give us cool new stuff? CSS Grid Layout Why not use flexbox? Other layout methods start with the item. Grid lines respect writing mode. Column line 1 is on the left and -1 on the right in a LTR language. Explicit vs. Implicit Grid ▸ The Explicit Grid is created when you define tracks with grid-templatecolumns and grid-template-rows ▸ If you place an item outside of that grid, or auto-placed content requires further row or column tracks these are added by grid as the Implicit Grid. CSS Grid Layout What about old browsers? Let browser vendors know which features you want. You can get involved in the future of CSS. Get involved with CSS ▸ Comment on or raise new issues against CSS specifications ▸ Raise bugs against browsers ▸ Vote on features where browsers have a platform to do so ▸ Write about new features - it demonstrates we want them ▸ Be nice while doing it. Browser engineers and spec editors work within constraints just as you do in your projects. @rachelandrew Talk resources & code: https://rachelandrew.co.uk/speaking/event/breaking-borders-2017 THANK YOU! View Start Using CSS Grid Layout Today on Notist. In March 2017 CSS Grid Layout shipped Firefox, Chrome, Safari and Opera. How do we get started using it today?